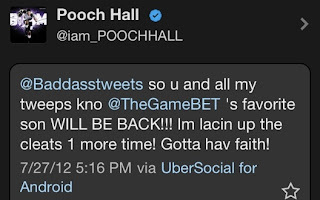 Pooch Hall announced on Twitter that he will be returning to BET hit show, ‘The Game’. Fans were left in shock after BET announced that Pooch Hall and co-star Tia Mowry would not be returning to the hit show. It definitely caught a lot of people off guard even the two stars. 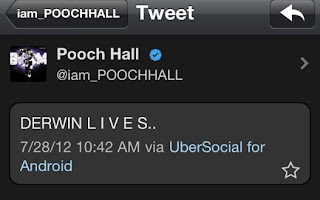 Pooch Hall was very vocal about his desire to return to the show, and it looks like his wish was granted. Rumors as to why the actor was let good swirled around the fact that he had signed on to a Showtime series entitled, Ray Donovan, which was in conflict with the shooting of ‘The Game’. 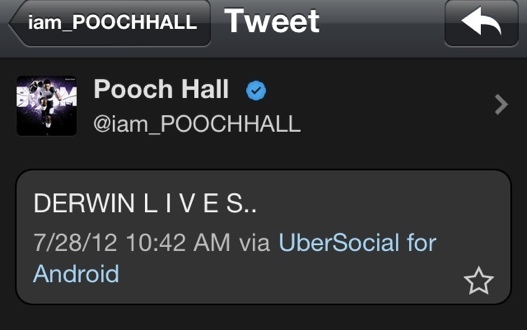 Regardless of Derwin’s resurrection, I will not be watching the show. The magic that it displayed when it was on the CW seems to be permanently gone. Although there were glimpses of its former magic in the season finale, it’s still not enough. The show has been ruined for me. The three seasons it ran on the CW will have to be enough for me. I’ll just pretend these seasons on BET never happened. I really gave the show a chance. I really truly did, but it’s just not there for me anymore. It’s not worse than ‘Single Ladies’ (I don’t think any scripted show is worse than that), but it’s nowhere near what it used to be and that’s such a shame. It really used to be a quality show, but not anymore. I can't say that I'm not going watch at all. 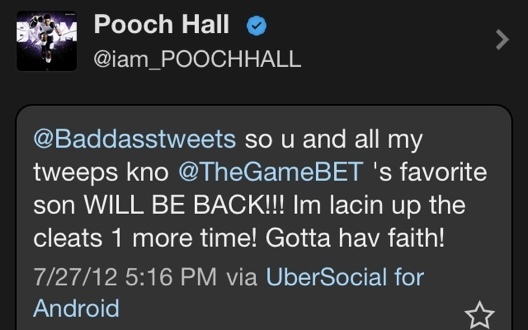 I'm glad that Pooch is back and hopefully they can get Tia to at least make guest appearances. I'm anxious to see how Lauren London does. With that being said, I know that I won't watch every episode because I agree that the show seems to have lost some of its appeal from its CW days. I know I am not inclined to watch it at all. If I happen to remember when it comes on, I may tune in. But this show is not at the forefront of my mind. BET disappointed me big time. No one I know likes how the show has turned out. I do not know what is happening with BET. The Game and their new programming has been terrible. Reed Between the Lines has potential but it seems like there is a lack of quality behind the camera. I'm really looking forward to TJ Holmes new show, Don't Sleep. I really like the concept but I'm not as confident about how it will turn out. I hope I'm not disappointed. I cannot wait until there is a Black show on par with Breaking Bad, Boardwalk Empire, Mad Men, Boss, Damages, Hell On Wheels, Homeland, The Newsroom, etc. Perhaps the show will be on YouTube or OWN.